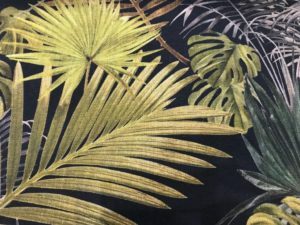 A big trend to hit interiors throughout 2018 is tropical print, and this spring we are set to see a rise in tropical themed interiors; from colourful cushions to humble house plants. There are plenty of ways to commit to this trend, from a simple accessory swap to a total restyle. 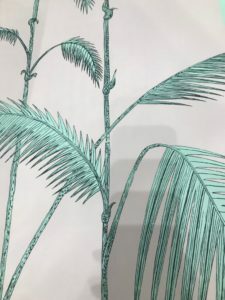 A great way to inject the tropics into your interior is through the use of a statement fabric. The creative use of a feature fabric can prove to be less overpowering than of wallpaper, especially with a theme such as this. Perfect examples of this are Jab and Matthew Williamson fabrics! 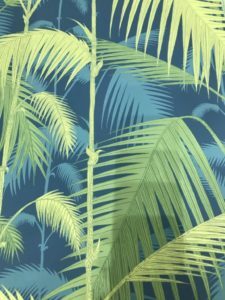 If you are feeling a bit more adventurous, try Cole & Son’s famous ‘Palms’ wallpaper with matching fabrics coming soon! Another trend to hit big this season is a pop of colour! Beautiful bright, bold colours are rapidly making their way into interiors. 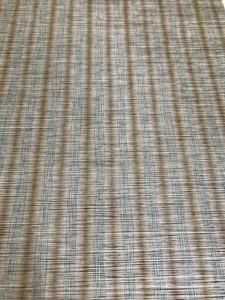 Fabric is the ideal way to invest in this trend. 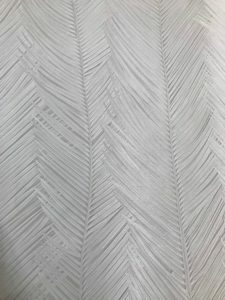 It’s ability to be used in small doses, such as for cushions, means its easy to create the look you desire. 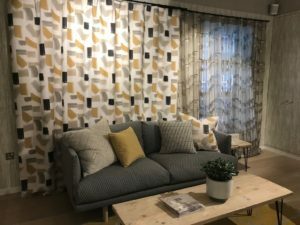 If you are still looking for a feature fabric that will tie in with your existing scheme, Harlequin have a fantastic range of bold designs to brighten up any space! 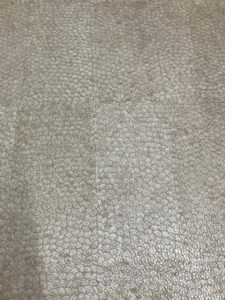 If you’re stuck on how to decorate the walls to let your fabric shine, check out our previous post on how to use subtle textures on your walls. 2018 is also set to be the year of leather and velvet! Think leather upholstered headboards and quilted chairs to add a bit of glamour to the interior. These luxurious looking fabrics are becoming even more popular with velvet to be the fabric of choice for statement soft furnishings. Clarke & Clarke’s faux leather collection has a fabulous selection of colours from bright and bold to soft neutrals and metallics. If you are thinking that your dream velvet isn’t up to the test of family life, G P & J Baker’s stain repellent velvet collection is here to help! These velvets are not only ultra soft but are also not going to break the bank. Pop in store to speak to our friendly staff and see the collections for yourself! 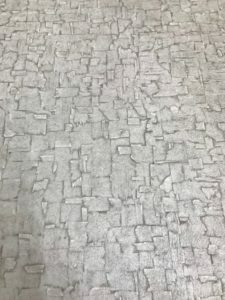 The future of feature walls? Whilst feature walls are still in high demand, as we progress further into 2018, we are seeing a big move away from feature walls. 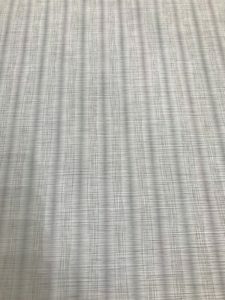 Subtle textures on all walls is becoming an increasingly popular trend and provides the modern hotel look that so many are after. 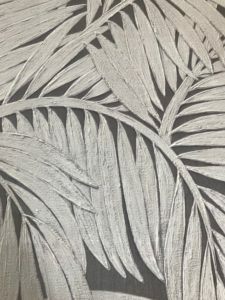 Although we still love the funky feature look, brands such as Arte are truly coming into their own showcasing beautiful textured vinyls that are both practical and effective. 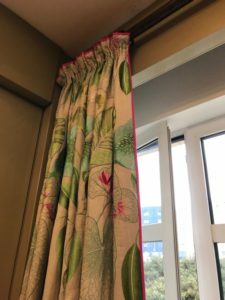 Using a more subtle, soft palette with a fun texture allows more experimentation with accessories, cushions, curtains and chairs can burst with creative colour and pattern. Neutral walls provide more scope within the scheme for accent pieces to be added as you please. It also makes for a more seasonal space, spring can convey pastels and lively patterns, meanwhile winter will present dark, cosy velvets. 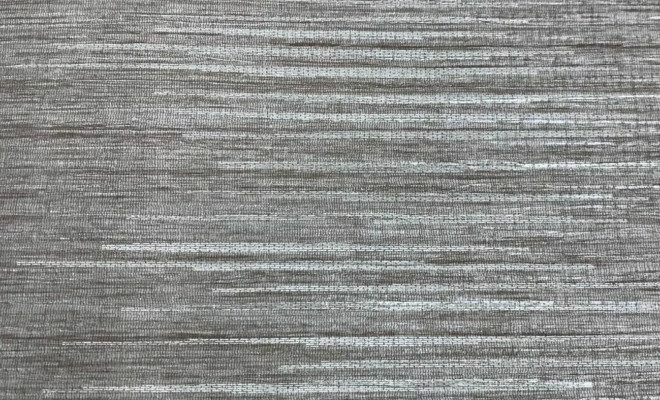 Textured papers often come in the form of a vinyl and are hard-wearing and washable, meaning that they are one of the more robust wall-coverings out there. They also don’t have to cost lots. 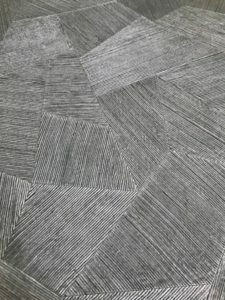 This rich look can be achieved on a budget, brands such as Galerie or Clarke & Clarke offer a great range of textures that look the every bit of luxury. 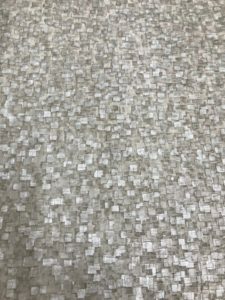 Older collections such as Zoffany Mosaic and Elementi still hold their ground with a timeless look that is as popular as ever, new collections are continuing to be launched, like Osborne & Little Lucenta Vinyls, bringing a fresh, modern twist to the vinyl market. Wallpapering the whole way round a room doesn’t mean you have to give up on your dreams of a dramatic space. Drama can be brought out though textures and patterns alike. By using dark colours or heavy textures, your desire for drama can be fulfilled. 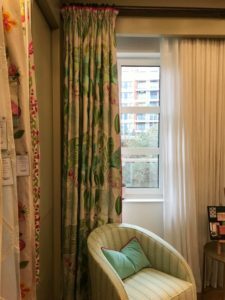 If you still crave a bold design, bring it in through fabrics! To find out more about how to do so, keep an eye out for our next blog. For further advice, pop in store to speak with one of our friendly, experienced staff members. London Design Week has commenced! 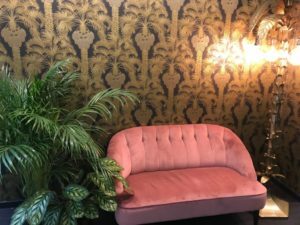 The design show, held at The Design Centre Chelsea Harbour, proved that pastel shades are back with vengeance. 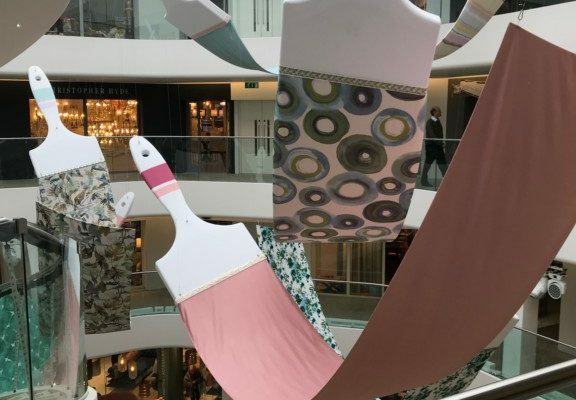 These fresh shades are set to make a big impact on homes this summer with their presence already being noticed on catwalks. Silk and satin fashions are leading the way to soft, subtle interiors creating that summer feel. 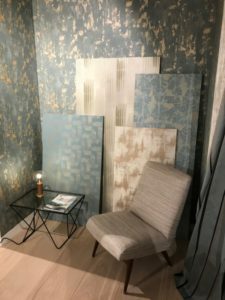 Cole and Son beautifully demonstrated how to use sorbet shades as a statement against dark, dramatic wallpaper. A great way to include this gentle pop of colour is by upholstering a large piece of furniture, if Cole and Son’s pink hue is too girly, try pistachio, mint or lemon to introduce spring into your space. Geometric patterns pair perfectly with these statement shades. Adding a sense of sophistication and bring a modern twist to create a refreshing style. 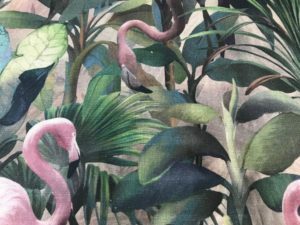 The new Manuel Canovas collection is a genius mix of trends, using a statement tropical fabric with a striking trim alongside a simplistic pastel chair. The bright pink trim brings the matching embroidery to life, this is a unique look that truly mirrors the upcoming summer vibes. By using the pastel patterned chair, the summer-like scene is complete, the piece adds an element of softness whilst not distracting from the ‘wow’ curtain. 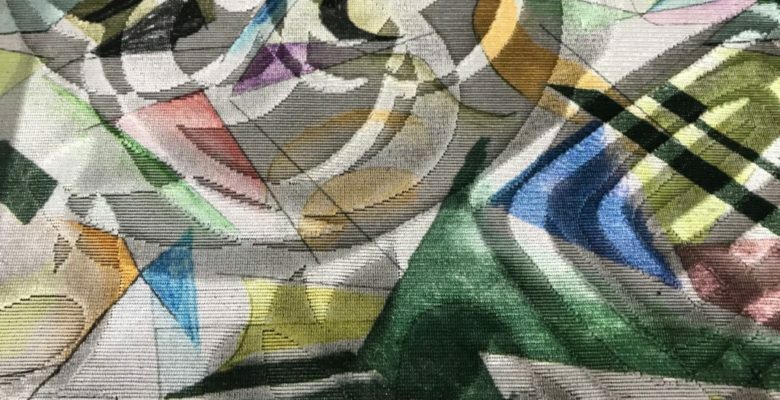 The Design Centre focused its decorative theme on “the rise of individuality and creative expression” with an amazing “Canvasof Creativity” installation. 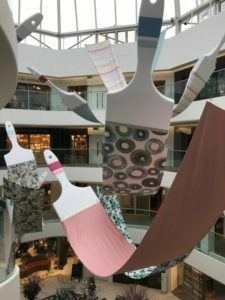 The piece included a range of fabrics, paints and trimmings draping across the ceiling from larger than life paint brush handles. 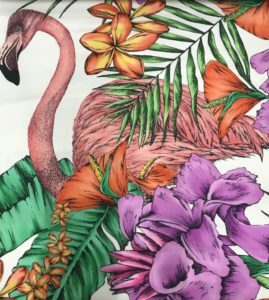 The stunning creation showcased a tremendous explosion of colour, including both pastel, sorbet shades and bright, funky tropical prints. Kirkby showcased their striking Eley Kishimoto collection beautifully. Despite using various bold, contrasting patterns, the team styled the showroom brilliantly. 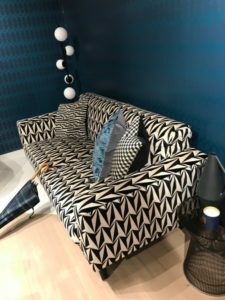 The monochrome Origami Rockets design looked amazing as a sofa even with conflicting cushions. The collection together worked excellently. We also got to see sneak peaks of Romo and Villa Nova’s new collections, which we are excited to share with you all. These geometric prints are simply gorgeous, with wallpapers that are equally fabulous. From papers to vinyls, velvets to sheers, these collections have everything and more! 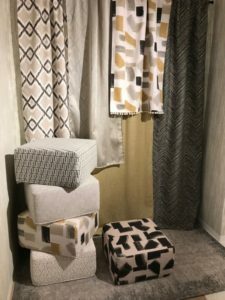 New collections arriving in store soon so be sure to pop into the shop, speak with our friendly staff and decorate your home as delightfully as London Design Week!